In the Society for Creative Anachronism I portray a 16th century (around 1540) Italian (or possibly Hungarian) slave in the court of Kanuni Suleiman. Mundanely, I am a web designer, student and government slave wasting away between class and work. I am a very proud catmom and loving fiancee to Lord Ashikaga Hideyoshi, mka Taylor B, aka the Giant Irish. BIG News of Both the Mundane and SCA Variety! My deepest apologies for having disappeared for so long! The summer months are usually SCA-free for us so most attention wanders away from clothes and customs and more toward the mundane. However, I wanted to check in as I have some grand news to report! First, as of May 24th, 2009, my Lord Ashikaga and I are officially engaged! Of course much craziness ensued and I lost touch with the outside world for a minute. We have decided to plan the wedding for October 16, 2010 which gives us more than enough time for balancing wedding life with all other life! Second, Happy 30th Birthday to my beloved Ansteorra!! We attended the grand affair last weekend and, while it was unbearably hot at times, enjoyment was had by all! 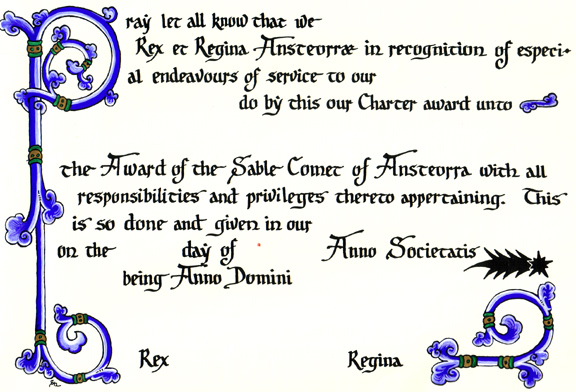 Third, a very boisterous VIVAT to our newest Steller Highnesses, Owen ap Aeddan and Genevria di Betto di Adriano!!!!! If you will recall, we were honored to watch Sir Owen compete and win Wiesenfeuer Championship last April and now we will be honored to watch him ascend the throne this November! Huzzah! This will be the first Northern Ansteorran to win crown in a very long time, so we are all overjoyed at getting to witness a Coronation in our own backyard, so-to-speak. I have been asked to DJ a steampunk party next month at SoonerCon and I really want to look the part. Can anyone give me some pointers on making an underbust corset? I have found some patterns online that seem easy enough, but can I buy steel boning at craft stores or is this something I have to order? I'm going to need the strong stuff to hold all the me in! I think it's coming along quite nicely for my first scroll ever. I got lots of compliments on it from other people who were there which boosted my ego a bit... Okay, a ton. I'm using kind of bright, obnoxious colors because they told me I could paint it however I liked and I figured it couldn't hurt anything to at least practice with primaries. That was also before I had really researched what Ansteorran scrolls look like. Guess I'll be a little more picky with my color choices next time. I absolutely adore it! It was done by a talented lady from The Steppes named Oranna (or possibly Osanna?) de Burgh. I wonder if the person who picked it out for me knew that fall colors are my favorite? My name is misspelled, but that doesn't even matter to me that much. 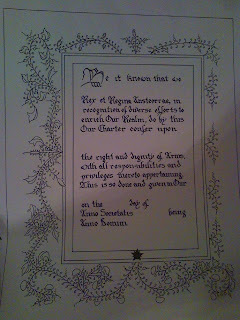 Shanna also gave me a scroll that someone else had abandoned, with the instructions to "pretty it up." I plan to use that one to acquaint myself with gold ink. 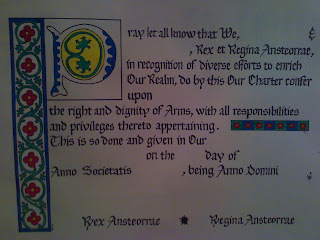 It's the same as the scroll I'm currently painting. 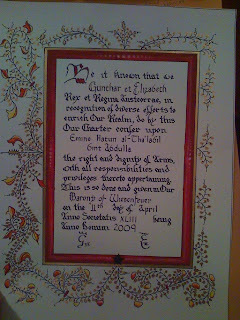 I don't expect to ever draft my own scrolls or draw extremely intricate designs in the background or add in the recipient's coat of arms or calligraph it in some visually striking style, but I truly enjoy painting the charters and pattering along behind my mentors, HL Nicolaea, Lady Danielle and Lady Shanna. This has been an... odd week. Over the weekend we had a house guest: Lady Danielle was in town for a work function, but they were not providing her with lodging, so I offered for her to stay with us. I just started getting to know Lady Dani at the Medieval Fair. She and Lady Nicolaa were doing a lot of illumination under the Living History pavilion and, while I was busy doing other things, in the back of my head I was wondering if illumination was something I could do. My grandmother was a painter and every summer when I went to stay with her, she insisted I paint something while I was there. Usually that was the nap alternative, so I was happy to comply. Now that I'm older, I can't help but think my grandmother was looking for some painting talent in her favorite granddaughter, and while I don't think I'm just gifted or anything, at least I can stay in the lines! So when we went to a demo for the Campfire USA kids last Saturday, I asked Lady Dani if she could get me started with illumination. We had made papier mache masks Friday night for an upcoming masquerade ball, so I had purchased brushes (a pack of 30 various sizes and qualities for $5). When we got to the demo, there was an illumination table so we set up there and she and Lady Shanna got me started with paints and AoA charter scrolls. The particular scroll I was working on was laser printed on nice paper and had very little decoration -- just a bar with vines and flowers on one side, a simpler version to the right at the end of a sentence and a decorative capital "p." I started painting the flowers red and was having a grand time of it when the skys opened up and started pelting our covered pavilion with rain and pea-sized hail! We were doing okay for a little bit because there was a generous overhang on the roof, but before long the wind picked up and we started scrambling about trying to save the scrolls. I threw mine in Lady Shanna's portfolio and that was that for the rest of the day. What exactly does this have to do with the ongoing subject matter? Lady Dani has Persian scrolls I can learn to make! Woot! And since the Ottomans wrote most (if not all) of their poetry in Persian, I can't wait! It is the east, and today is Talk Like Shakespeare Day! No, I don't live in Chicago, but if Talk Like a Pirate Day can go international, why can't a day honoring The Bard himself?! If you can't tell, I love the Shake.